The UCONN women's basketball and Boston Red Sox nations felt a significant tremor in the Force on Friday, February 10th, when Julia Mary (Shermeta) Jones, 78, of East Hampton, Connecticut took her final journey. Julia was born on December 29, 1938, in Northampton, MA. She had spent the previous week with family recuperating from surgery in Atlanta, GA, and succumbed to unexpected complications. She was preceded in death by her daughter, Meredith Moore, and her parents, Stanley Shermeta and Mary (Shea) Shermeta, of Northampton, where she will be interred. She is survived by her long-time partner, Fred Osterholtz of East Hampton, CT; her sister Martha and brother Daniel of Northampton, MA; sons Christopher Jones of Atlanta, GA and Jonathan Jones of Sarasota, FL; son-in-law Daniel Moore of Marshfield, MA; and grandchildren Bryan Price, Mary Jones, Susannah Jones, Gretchen Moore, and Nathan Moore. She is also survived by the loving family of her partner, Fred, including his son Fred and wife Fran, their children Ben and Kate, Fred's daughter Louise (Gus) and her daughter Petra, and many loving, nieces, nephews, in-laws, cousins, and friends fortunate enough to know her. Julia graduated from Northampton High School in 1956, and attended Bates college prior to raising her family in Michigan, Los Angeles, the greater Boston area, and Monroe, NY. 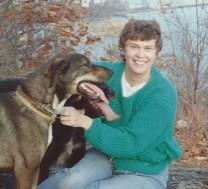 She re-entered the work force in the early 1980's and eventually landed at Union Carbide in Sterling Forest, NY. Following a number of mergers and acquisitions, she finished her corporate career managing Human Resources for Hoffmann-La Roche Pharmaceuticals in Nutley, NJ and then formed her own company, Human Resources Systems Alternatives, which operated successfully until her retirement. During retirement, Julia enjoyed travelling, spending time with her family (both of those at the same time, especially), gardening, cheering for the Lady Huskies and Red Sox, and advocating for women's rights and the preservation of North American Wolves. She shared her life's joys and passions through social media. She organized some spectacular vacations for her family and introduced her sons to their Irish heritage and family in southwest Kerry. During her lifetime, Julia's family, and extended family, came to know her as a force of stability, radiant joy, unwavering warmth, and genuine kindness. She spent countless, selfless hours caring for her daughter during a long battle with cancer and spent many more caring for those that loved her during her own battle with the disease. Julia made everyone around her feel they were the center of her world and empowered them through her strength and love. She demonstrated that each of us is important and that each of our accomplishments and chosen fields are something of value - that we should never be afraid to stand tall, to make hard decisions, and to stand for what we believe in. Her love and devotion enriched our world. A celebration of Julia's life will occur on March 18, 2017 at the Garden House, Look Park, in Florence, MA, 1130 am. In lieu of flowers, the family requests donations be made to The Hope Lodge, Boston. Arrangements under the direction of Advantage Funeral & Cremation Service, Lilburn, GA.